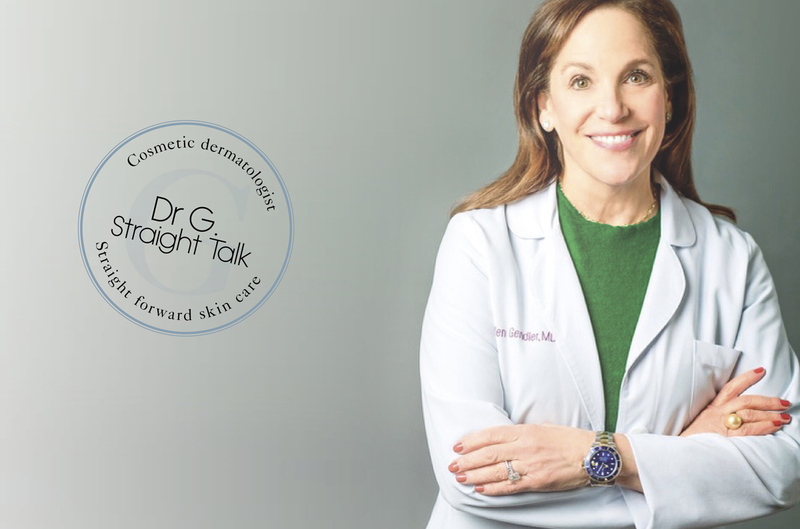 No one gives us the real “skinny” on skin care like Dr. Ellen Gendler which is why we can't stop asking her questions. My sister is 55 and her once beautiful skin is beginning to look papery and wrinkly. She is the lowest maintenance person on the planet. Where does she begin to try to reset her skin? What advice can you give her, and people like her, who have not taken skin care seriously and who will not consider injectables? The best thing your sister can do is to get herself on a regimen of retinoids—preferably the real thing, prescription Retin A prescribed by a dermatologist. If she has brown spots and irregular pigmentation, a bleaching cream would be in order, too. It sounds like her skin texture is what is bothering her, and by using topicals she should be able to achieve some nice results. And of course, she needs to use a broad-spectrum sunscreen in order to protect her skin from further damage. Exfoliation is everywhere– which is better the manual abrasive kind or the liquid kind? There are many types of exfoliation. In fact, Retin A is actually an exfoliant of sorts. Using a Clarisonic brush gently is a nice exfoliator, and it can be used daily. When using mechanical exfoliants, the particles should be tiny and regular—do NOT use crushed nutshells, as the particles are too varied and can easily cause abrasions. Should any kind of exfoliation be combined with Retin A or not? Not necessary most of the time, and definitely not at the beginning of treatment when the skin is just getting used to the actions of the retinoid. How do we get more moisture into our skin? Is this even possible or does it all just sit on top like salad dressing? We can hydrate the stratum corneum (top layer) of the skin, and that can improve the dewiness of the skin. Some creams can penetrate to the upper layers of the dermis, too, but it’s less important. What makes one’s skin feel dry is the top layer, and regular use of a good moisturizer can keep that layer soft and supple. We hear millennials claiming that facial oils are all that…are they? All that what? It’s a big fad. I personally don’t like oils at all. They are not very moisturizing. While some oils (like marula) contain a little anti-oxidant as well, it’s not enough to make a difference. In my opinion, marula oil is just one of the newer fads which will soon be replaced by yet another fad. Remember Emu oil? Some people like the way oils feel on their skin and I say that if you don’t develop little follicular bumps and acne from them, then it’s fine to use them. Also, bear in mind that oils do not cleanse, so the concept of using an oil to “wash” is an oxymoron. If you use an oil to remove makeup and other debris from the face, you need to follow it up with a cleanser or toner to remove the greasy residue. Will apple cider vinegar fade dark spots? What’s all the buzz about Micro-needling and PRP? Those are two entirely different topics, though some people will follow micro needling with PRP right afterward. Micro-needling can be done at all levels, from very superficial to very deep, and the downtime and results are profoundly different. When done deeply, it can be the equivalent of a dermabrasion, and when superficial, it can be like a mild exfoliation. The jury is still out on PRP in any capacity—-be it with skin care, hair loss, or orthopedic injuries. Some feel that injection of one’s own plasma can stimulate new skin cells to develop, but there is no hard science to back this up—-yet. For now, if you are willing to spend the money (it’s not cheap) and are looking for simple procedures that might help, it’s a good one to try. Can free radicals be fought? Do they need to be? Why and How? Definitely. And it’s very important. This is where sunscreen is imperative, and using other ingredients such as anti-oxidants and DNA repair enzymes is a very important element to a skincare routine. I’ve heard about a new sunscreen that does double duty repairing sun damage. Is this wise? EXTREMELY WISE, but it is pricey. The alternative is to use a cream that actually repairs the DNA from sun damage as the base layer and then another sunscreen on top. Is it more effective to stick with one line of skincare or “dance around” a list of favorite products? Most of us are so tired at night, is a long bedtime skincare regimen really necessary? What is absolutely essential? The most important thing to do would definitely be to take off eye makeup (especially liner and mascara) to help prevent the development of styies and chalazia. And if there is one product that should be applied above all others, I would say a moisturizer that actually performs a function, so either one with growth factors, DNA Repair Enzymes or a form of Retinol.